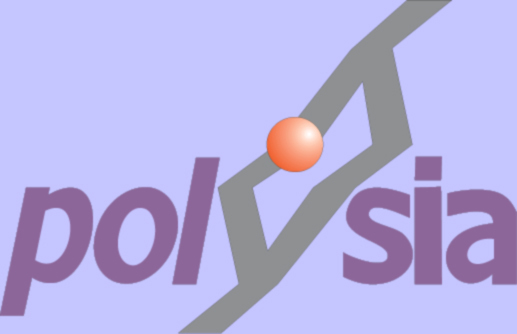 Soluble PolySia and PolySia-based scaffold materials are evaluated in vivo. PolySia and PolySia-based materials are incorporated into nerve transplants which could be additionally substituted by transplanted Schwann cells. 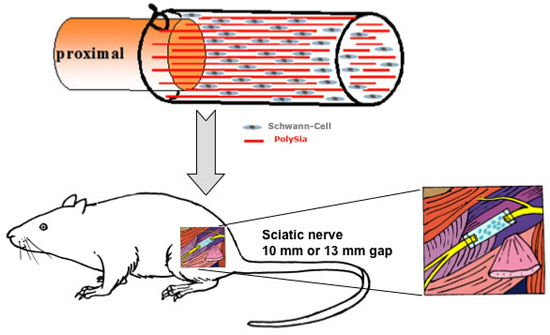 Exemplarily, the incorporation of PolySia-nanofibres and Schwann cells into tubular nerve transplants is depicted. These biosynthetic nerve transplants are sutured between the stumps of transected sciatic nerves of adult rats to bridge a 10-13 mm long nerve gap. The outcome of the regeneration process is evaluated by functional and histomorphometrical methods. (1) Macroscopic evaluation by the end of the observation period reveals whether the separated nerve stumps are reconnected by regenerated tissue. (2) Recovery of sensory and motor functions is measured on a regular basis using animals that are awake. Additionally, electrodiagnostic measurements are carried out in the anaesthetised animals at the end of the experiment (e.g., recording of compound muscle action potentials to determine the nerve conduction velocity). (3) Quality and quantity of regenerating neurons was investigated by retrograde tracing of these cells. (4) Histomorphometrical analysis of semi-thin cross sections through the regenerated tissue elucidates the number of regenerated myelinated axons.